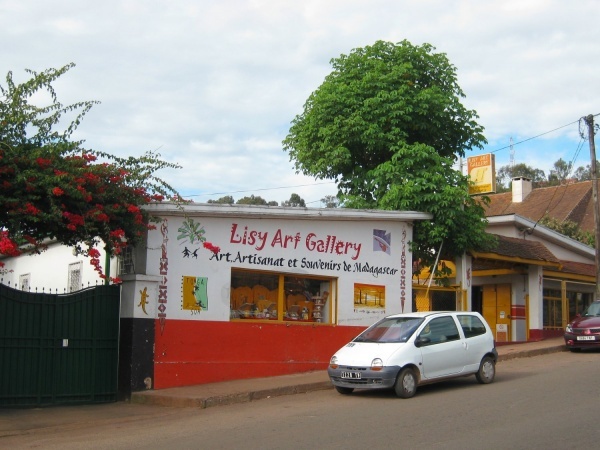 Lisy Art Gallery is a shop in Antananarivo which sells a wide selection of handcrafted souvenirs, gifts, toys, embroidery and ceramics as well as various confectionery, food and drink products. Unlike most souvenir markets in the city, prices at Lisy Art Gallery are fixed, although not necessarily higher. Lisy Art Gallery is popular among foreign tourist and is especially recommended to anyone who do not like bargaining. A clothing store and a lunch restaurant belonging to the same company is located right across the road. The shop is open Monday to Friday from 8.30am until 6.30pm and on Saturdays between 8.30am and 12.30pm and from 2pm until 6.30pm. View all Lisy Art Gallery photos. This page was last modified on 28 January 2017, at 16:08.